BARREL CACTUS Pretty Valley Ceramic Fragrance Diffuser - Ocean Breeze Ocean Breeze has airy citrus and marine top notes that give way to water lily wrapped in creamy floral notes and musk. 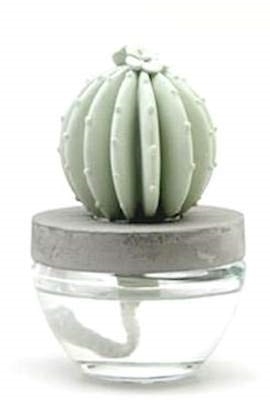 Fragrance wicks up the cotton wick into the ceramic cactus and continuously adds scent to your room for several months. About 6 inches tall x 3.5 inches in diameter. Gift box dimensions are 9 inches tall x 3.7 inches in diameter Many brands of ceramic diffuser refills available including Courtneys Candles Ceramic Diffuser Refills. 100 ml or 3.3 fluid ounces of fragrance included.